Global experiences 101: What’s on the horizon? Hone your global mindset and thrive in the global economy. It’s crucial that university students who aim to engage in the global arena understand the aspects of the world’s dichotomy. 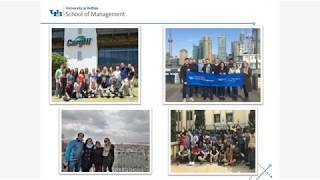 That’s why the School of Management provides short-term, faculty-led global experiences that compliment other traditional study trips that aren’t always accessible for busy students. These new opportunities will explore different topics surrounding social innovation, entrepreneurial leadership, culture and economic development in different parts of the world such as Africa, Asia, Europe, South America and more. When we expose students, faculty and alumni to new culture, we continue to hone their global mindset and empower them to thrive in the global economy. Dorothy Siaw-Asamoah, BS '03, MBA '05, PhD’12, is clinical assistant professor of organization and human resources and faculty director of Global Programs in the UB School of Management.